It's always a pleasure to discover a new indie author who knows how to tell a good story. The Wizard that Wasn't moves along at a good pace. There's always something happening, and the stakes are always high - and always personal for the characters. The characters, in turn, are distinct, their motivations are clear, their conflicts are understandable. There's humour, but also drama. 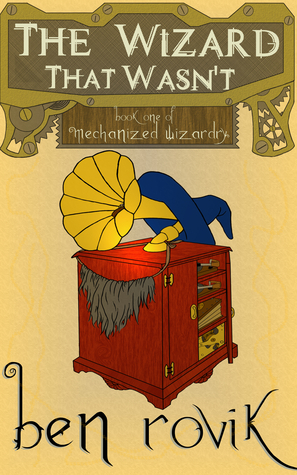 Sometimes there's humour and drama at the same time, as when the protagonist is shut in a closet running a machine that he hopes will rescue the princess, and has to come up with ever wilder excuses about what he's doing in there so as not to get shut down. I listened to Ben Rovik's zestful reading on Podiobooks, and as soon as I'd finished I bought the ebooks of both this and the sequel (which I'm currently enjoying). If you want to see what it looks like when dieselpunk-fantasy is done well, get hold of this one. Sign into Goodreads to see if any of your friends have read The Wizard That Wasn't.